Flossing removes plaque and food particles from between your teeth and under the gum-line, areas a toothbrush can't reach. Your dentist or hygienist can show you proper flossing techniques. Hold the floss tightly between your thumb and forefingers, with about an inch of floss between them, leaving no slack.Use a gentle rocking motion to guide the floss between your teeth. Do not jerk the floss or snap the floss into the gums. 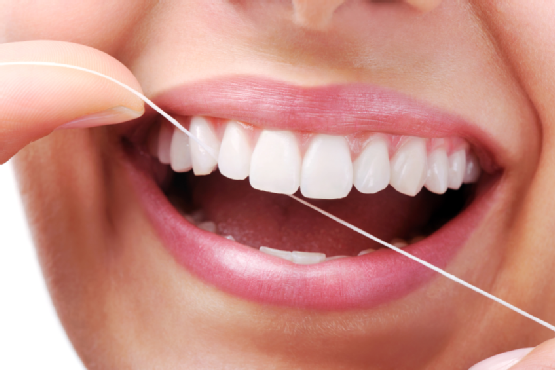 When the floss reaches the gum-line, curve it into a C-shape against one tooth until you feel resistance. Q. Should my gums bleed when I floss? A. Your gums may bleed or be sore for the first five or six days that you floss. This should stop once the plaque is broken up and the bacteria has gone. If the bleeding does not stop, tell your dentist. It may be that you are not flossing correctly or your teeth and gums need a more thorough clean by your dentist or hygienist. Q. What do I do if I have difficulty using floss? A. If you have trouble using floss you can use a floss holder. Your dentist or hygienist can explain how to use these properly.